Hey everyone. 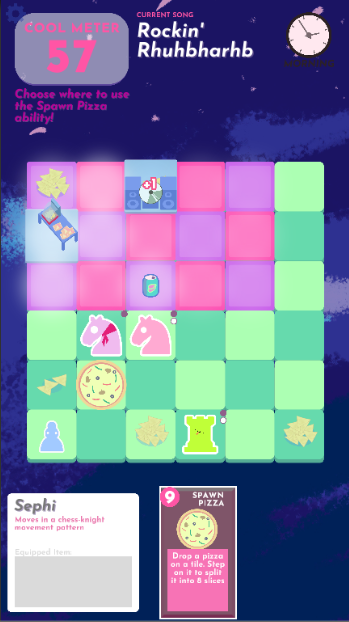 For the last nine months or so I’ve been working on a game called Chess Mix. I haven’t written a formal thing about it here on the website, so here’s that formal thing! Chess Mix is a turn based tactical strategy game. You move units around the board, which move like chess pieces, but which can’t capture each other. There are no Kings to capture or checkmate, and only one “side”. There are resources to pick up and units have special powers. The objective is to get a high score, but you might say the real objective is just to play around with it and have fun. There’s about a dozen different units, all with their own special abilities and strengths and weaknesses, there’s 14 missions to unlock and complete, there’s 5 songs, and 3 special “items” that units can equip. As you might have noticed, the game violates one of my theory-driven guidelines for strategy game design, which is that strategy games should (perhaps even “must”, in some ways) have a binary win/loss state. It is true that I think that’s ideal, but that also makes design about ten times harder, especially when you’re doing a weird and original game. I guess emotionally, I needed to just make a cute, nice, non-violent little thing that wasn’t going to take over my life for 5+ years (as Escape the Omnochronom and Auro both have, and will continue to do going forward; more on those soon). With this game I’m trying to loosen up a little bit, and also create an atmosphere that is a little less hostile and scary than some of my other games have been in the past. I’m really inspired by the work of Happy Snake (who, btw, provided some art for the game in the form of the opening comic and portraits). I like how they can just kind of “make something” inside of a few months, and concern themselves more with the cuteness and charmingness than whether or not this is like… some unbreakable infinite-fun-machine-forever-machine. Don’t get me wrong. The unbreakable infinite-fun-machine-forever-machines are still my main thing, but there are a lot of downsides to the pursuit of that, and sometimes we need breaks, is all. Anyway: so far, the few reports I’ve gotten about Chess Mix are positive. Two people whose opinions I really trust on game design have indicated to me that this game is pretty fun. I’m pretty happy with it! I’m really eager to hear more about what you all think of the game. The game is currently available on itch.io, and I’ll be putting it on up Steam soon, and probably on mobile devices at some point (which would make sense given the portrait orientation, dontyathink). Oh! And don’t forget that if you’re a Patron of mine at the $10 or higher, you get ALL my games for free, including Chess Mix.